We love the book! 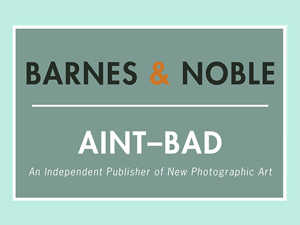 A bit of history for our Aint–Bad readers: Mascara, Mirth & Mayhem is an homage to the Independence Day celebration (called The Invasion of the Pines) that has been happening on Fire Island, off the coast of Long Island, New York, since you began going there in 1981. It marks the date in 1976 when a drag queen named Teri Warren from nearby Cherry Grove was barred from entering a restaurant in the Pines. Stephen Mayes in your book’s introduction writes: But just as the police learned in June 1969, [Stonewall Riots in the West Village] or anyone who has dared heckle a drag prima donna, so the Pines had to learn all over again: try to put a drag queen down and see what you get: a boatload of trouble. Several boatloads of trouble. Actually, four decades that flooded through the Pines dock in a relentless tidal of joyful rage. What would you say you have learned most from your 35-year-long journey of documenting this event as a participatory photo-essay? SK: I’ve learned over time that the Invasion of the Pines is many things to many people. For some, it is still a multi-faceted act of political protest by and about the LGBTQ Cherry Grove community. For many other participants. i.e. 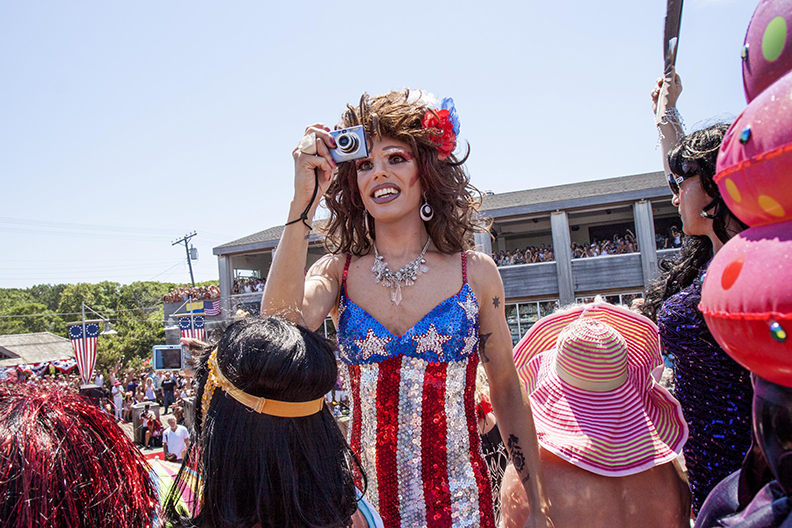 the men and women who have crossed-dressed for the day (not just drag queens), it is a day to relish the freedom of being allowed to be “the other,” to be the realization of their alter egos. On a more personal level, I have gained a much greater appreciation of the humanity of Invasion participants and for their ability to experience joyfulness in their lives. No doubt over the years, as I accepted my new life as a lesbian, I was able to photograph with even greater abandon and appreciation of what I was witnessing. LJY: I like Taylor Mac’s comment at the beginning of the book. He wrote about The Invasion of the Pines Fourth of July experience: When you have that much freedom of expression, combined with very little exchange of commerce, one actually does feel proud to be an American. So many of your photographs can be read as testaments to a spirit of true freedom, a protest of daily restrictions, a temporary release from conformity, a glee that is boundless. This is not just Gay Pride, but American pride as well, an exercise in freedom of expression. It seems that perhaps the Invasion will be seen in this way through the lens of history, through the lens of your camera. Can you say a few words about Mac’s comment? Is there one of your photographs that comes to mind in particular in light of his statement? SK: The photograph that comes to mind [see below] was taken in 2011 right after the arrival of the Invasion boat in the Pines’ community. 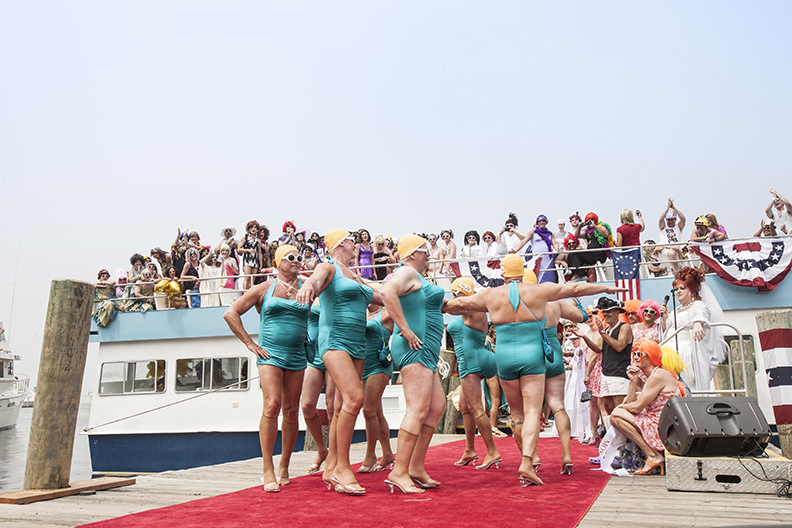 In this particular image, eight middle-aged white men dressed in turquoise one-piece bathing suits with yellow bathing caps and wearing white-rimmed sunglasses, half stockings and mules, are engaged in a riotous dance skit on the red carpet that leads from the ferry down the ramp to the Pines community. There are American flag buntings to be seen everywhere. Taylor Mac’s insight was right on: this is the ultimate in all-American freedom of expression requiring no price to pay other than the belief that we are all in this together. 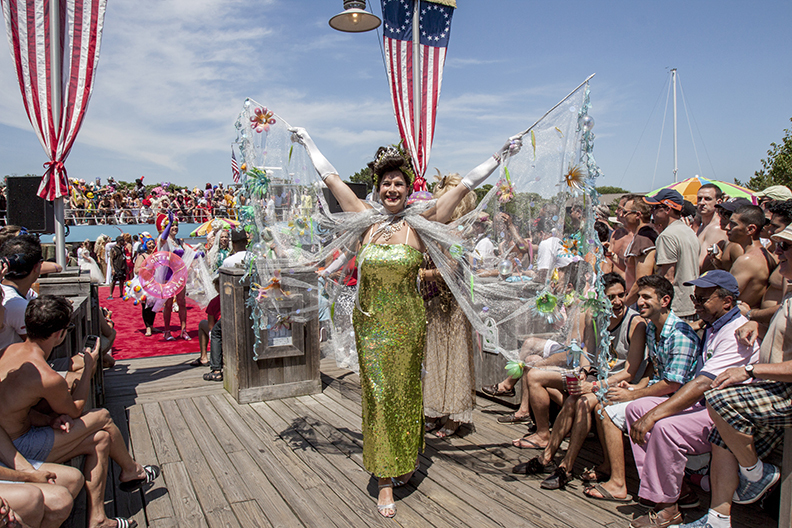 There is nothing as moving as hearing hundreds of drag queens sing God Bless America as the Invasion ferry pulls into the Pines’ harbor! Seriously. LJY: The photographs are so beautiful and so bodily, bold and outrageous, like a Technicolor release of energy, personality, and play that had been bottled up throughout each year of each Invasion and suddenly unbridled all in one place, all at one time. Like the ultimate Gay Pride Parade in concentrated form. How has the spirit of the event changed over the years? Did it move from more confrontational and overtly political to more celebratory and playful? Or would you say that these images can be read with as much political imperative (or more?!) in 1981 during the Reaganomics years as they can be read in 2017? SK: The Invasion began as an act of playful protest and evolved into an event of celebratory playfulness. As the decades changed, the political temperament surrounding the Invasion changed too. It was scary to be an out gay person in the 1970’s (and long after that). The very first group of people who cross-dressed and “invaded” the Pines in 1976 in protest did so with great trepidation. 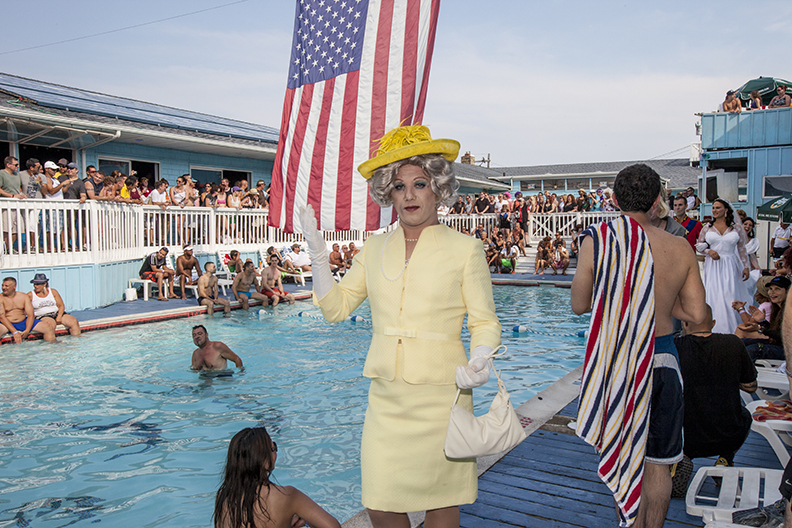 Cherry Grove’s Homecoming Queen, a/k/a Panzi, spearheaded the event, announcing that the Queen would “invade the colonies.” The 1980’s and 1990’s were tragic years in Cherry Grove as AIDS decimated gay men while the Federal government stood by and watched. Now LGBTQ people are out and proud and even free to legally marry (for the moment). The Invasion has persevered during good times and bad, and has always served as a day of joyous celebration, even as lovers’ ashes were spread across the Great South Bay on the way to the Pines’ Invasion. LJY: What has been the reaction to your book? Have any observations or responses stood out to you the most? 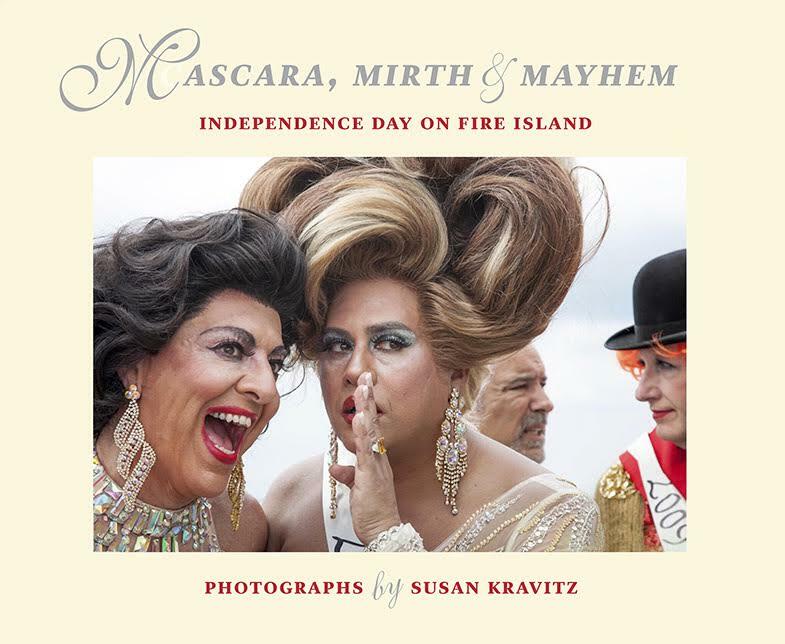 SK: Social media has praised Mascara, Mirth & Mayhem: Independence Day on Fire Island since its publication in 2016. 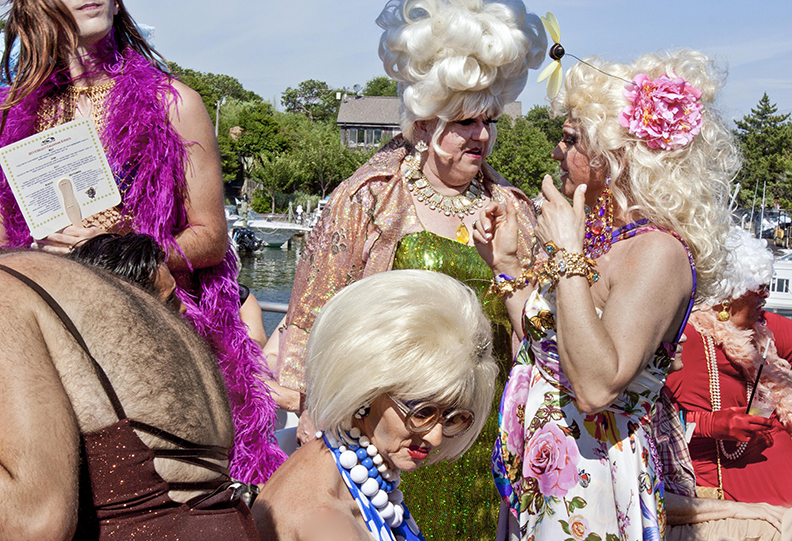 Huffington Post referred to it as… “a dazzling coffee table book.” LOGO TV called it a… “Stunning New Photography Book” [and] “a jaw-dropping marathon of extravagant looks….” Surprisingly, the heterosexual world seems to love these joyous photographs of drag queens as well. But more importantly, the LGBTQ community has embraced my book with great respect and appreciation. 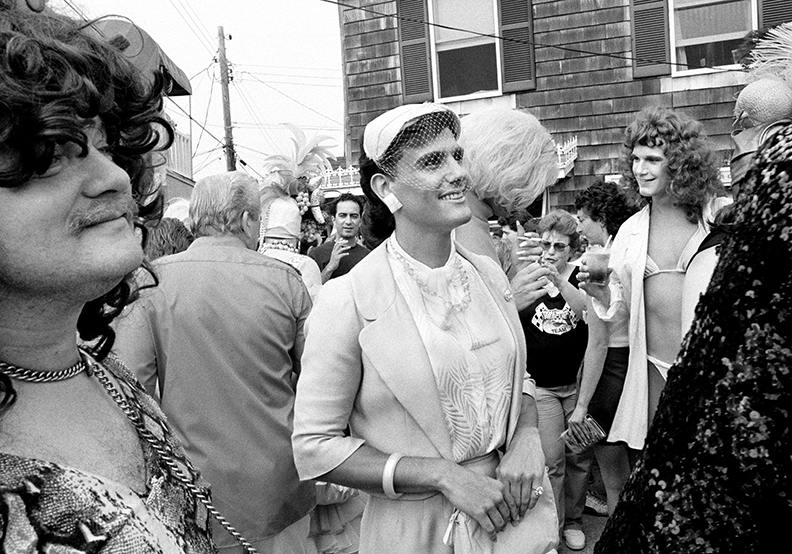 They understand that the photographs in the book capture not only the Invasion but also the history of the LGBTQ movement in Cherry Grove from 1985-2015. And then there are the photographs of so many Grove people who have passed away over those thirty years. It’s a history that has not been well-documented nor sufficiently appreciated by a community used to being under cover for so much of its life. LJY: Susan, I’ve known bits and pieces of your photographs for seventeen years now (! ), and your new book strikes me as a true celebration, a patient and participatory accomplishment, documenting an ongoing and historical event. 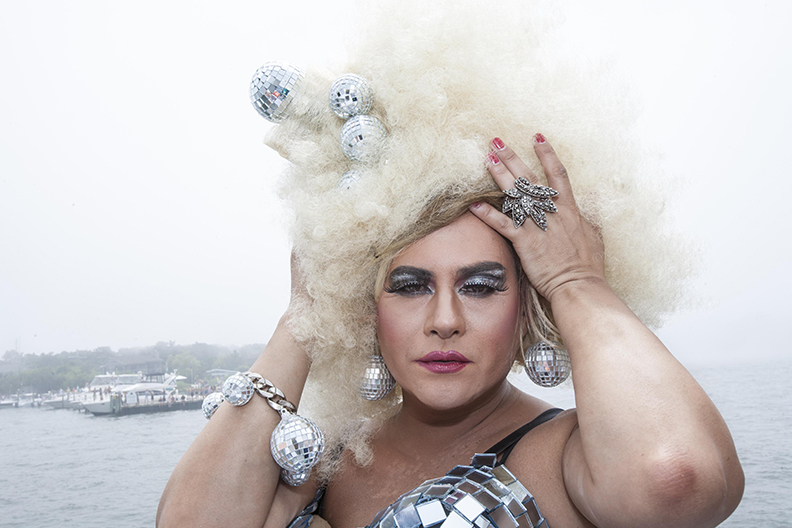 As a photographer with a focus on the ‘social documentary,’ can you say a little bit about how your photographs elucidate the drag queen as a role? The desire “to be a lady,” “to be glamorous,” “high style”? Or to quote Troy Beach DeBree in the book: “…you think you look beautiful, but you know, you’re still this big ol’ man in a dress.” I like his statement because it acknowledges all of the desire and the artifice at the same time. It embraces the role of fantasy and the desire not to be restricted. 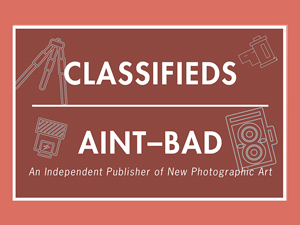 What have you learned through your camera about this role in our culture? 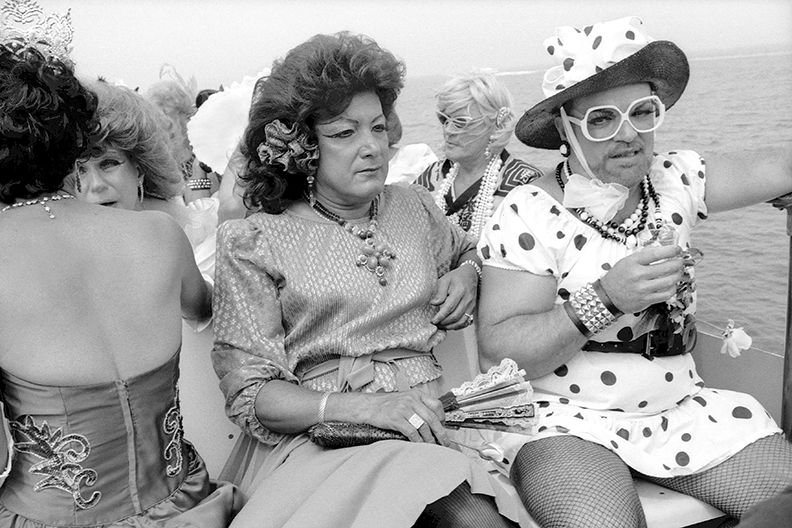 SK: When I first regularly visited Cherry Grove in the 1980’s, my feminist nature was appalled at how drag queens portrayed women. They dressed themselves either as female sluts or as frumpy ladies who had raided their mother’s or even their grandmother’s closets! There are black and white photos in my book that illustrate this thought. As drag became more acceptable and popular, i.e. RuPaul’s Drag Race, male drag evolved to a point where it became more professional and more respectful. Men want to be dressed as beautiful women (okay, with a bit of a raunchy side to them), wearing beautiful gowns, jewelry, shoes and wigs. You can see examples of this in the book’s more recent color images of drag queens. I have been fortunate to have been close friends with Troy “Beach DeBree” and his husband over the past ten years. I have had multiple opportunities to photograph them over the many hours it takes to transform themselves into beautiful women. That in turn has informed my work in ways that I can’t even begin to explain. LJY: You mention at one point that in your work you search for one meaning through the act of photographing but that you often find another. Is there any single photograph in Mascara, Mirth & Mayhem that you can think of in which this happened for you most dramatically? SK: Perhaps the photograph entitled Aboard the ferry, 2010, might serve as an example. I’m sure I was searching for an image of fanciful drag queens engaged in the colorfully exciting adventure known as the Invasion. Instead I discovered a group of drag queens who had been “in the business” for some time, and not as attractive as their younger counterparts on the ferry. 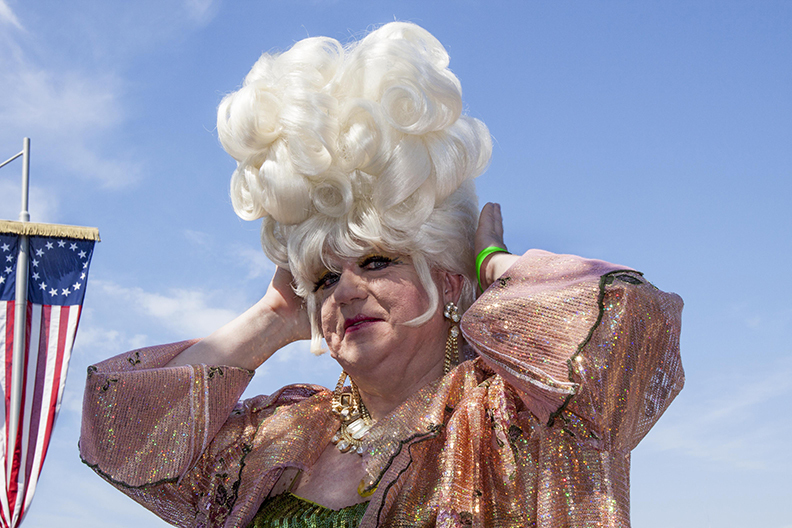 It brought up an unexpected visual conversation about what it is like for drag queens whose looks change as they age. My photo was no longer about drag glamour but about everyman’s struggle with growing old in a more beautiful, more youthful society. To view more of Susan’s work, please visit her website! And to purchase a copy of her new book, click here!